If your main door is affected and this is the only door you have on your property, you should take extra care in what you do during the affected month. You will know it may not be a good time to take risks and also to take extra care of your health. On the 4th of February, we will be entering the year of the Yin Earth Pig and the Flying stars can be a little tricky this month so please be sure to read through the information below and make sure you have your annual cures and enhancers in place. 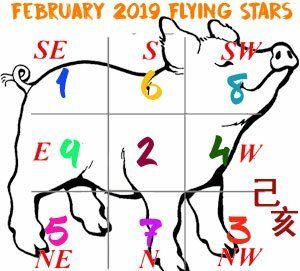 From 4th February to 3rd March 2019 is the first month Yi Chou (Yin Wood Ox) of the Ji Hai year (Yin Earth Pig) with the ruling energy of #2 in the central grid. If you have not already taken a look at the 2019 Flying stars, I would really recommend reading through the link below as the annual Flying stars will change in every home, office and building on the 4th of February 2019. As we enter the year of the Yin Earth Pig on the 4th of February, we will see a shift in energy in every single home, office and building all across the world and will give us all the chance to make to make the most of the year ahead if we are prepared. Tui 7 Red (Po Jun) has flown into the north for the first month of the Yin Earth Pig year. The #7 robbery star is a metal star which will be destroying the good annual #4 wood star so we will need to introduce some water cures in the north for February. Good colours are blue or black. If you are following the annual stars, you would be placing water colours in the north for the year so you will have little to do as this will be enhancing the annual #4 and weakening the monthly #7 at the same time. Avoid earth and fire colours and quartz crystals. If you have an office or door in this area be careful of people trying to deceive you, robbery, arguments and loss of wealth, always look at the very small print and be careful as this star normally causes problems with people you know and thought you could trust. – You should also use more blue, grey, black or charcoal colours in your decoration, especially during February. You can introduce the colour with cushions, rugs, bed covers or doormats. The 5 Yellow (Lian Zhen) star of tragedy is located in northeast this month along with the annual #2 star, causing a lot of problems related to overall luck, virtually all types of illness including many mind related problems with regards to thought process, lack of energy and procrastination if not cures and especially when activated with noise. Again, if you are following the annual stars, you will be placing metal cures in the northeast for 2019 and I would recommend placing some good quality heavy metal in this area in February as a #5 and #2 combination can bring a lot of problems into a home or business. The good news is you now know this is an inauspicious star and you can do much to dissipate its negative influences for the month so do not panic at all. If you are following the annual stars, you would need to place fire or wood colours in the east this month as this will create a harmonious balance between the annual and monthly star and also the earth element that we are using to enhance the annual #6. – Symbolic objects such as a wu lou or six Chinese coins can be placed here all month round to enhance benevolent influence. Kan 1 White Kan (Tang Lang) is a water element and a yang Trigram. In the physical body, it is the ear. The internal organ is the kidneys and it is also blood. It also affects wealth career and luck and because it is timely in period 8 (2004 – 2024) it is considered an auspicious flying star. In February, we have the monthly #1 fly into the southeast along with the annual #7 and also Sui Po. The southeast is very tricky in February as we have the annual #7 negative star fly in which we will be weakening with fire. If we were to enhance the monthly #1 star with metal, this would strengthen the bad annual star. My advice for the southeast in February is to introduce water cures as it is much safer to weaken a bad star than enhance a good star. water colours such as black or blue would be a good colour scheme for this room. You can introduce these colours in beddings, throws, lampshades, pillow covers etc. If you disturb this area this month you may cause problems for the middle son and it could affect ears, kidneys or blood-related. If you have any poison arrows like a lamp post, pylons or large comers of house’s pointing toward this area consider hanging a flat ba gua mirror outside pointing towards the offending object. Generally, there is nothing to worry about with the #1 star as it is it is timely and an auspicious star. – I would introduce water colours like black or blue in this area. In February, the #6 monthly star has entered the south, along with the annual #3 wood star. To enhance the #6 star, we will need to introduce earth cures but please be aware that this could aggravate the annual #3 so I would only suggest introducing earth cures once you have your 2019 annual cures and enhancers in place. 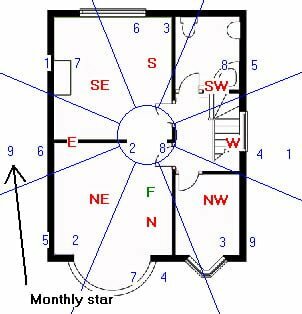 Those with a main door, office/study in this area could benefit this month although it is important that the door is not slammed as this could activate the annual star. Ken 8 White Zuo Fu is an earth star and a yang Trigram and is the most auspicious governing flying star of the lower era of the sexagenarian cycle of the flying stars (Xuan Kong) system which is period 8 (2004 – 2024). Unfortunately, the monthly #8 star has flown into the southwest along with the annual #5, both of which are earth stars making it very hard to enhance the #8 star without activating the negative influence of the #5. My advice for the southwest this month is to weaken the annual star using metal as it is much safer to weaken a bad star than try to activate a good one in the same area and hope for the best. Whilst wealth is possible this month for this area, beware of overworking as this can cause you health problems if you have a bedroom or office here. The additional work will bring a good income but be careful of your health; in particular stress related resulting in high blood pressure or kidney problems. – Please do not try to activate the monthly star with fire this month as this will also activate the inauspicious #5 annual star. – Although this will weaken the annual star, I would introduce a set of six coins and a salt water cure here for the annual #5 star. Sun 4 green Wen Qu romance and literacy star is a wood star. It affects the thighs, hip, buttock, bladder, liver and can cause colds and flu although on the whole it is considered an auspicious star. The Sun wood 4 is a conditional star and is auspicious in Period 8 (2004 – 2024). We have a nice balance of energies between the annual and monthly star in February in the west although please remember that we have the Three Killings located here for 2019 as of the 4th of February. It governs romance, career, travel, creative, academic and artistic talents, wisdom and intelligence as well as self-development. With the wood of the #4 star flying in for the month, we can expect lovely energy from here as it creates a lovely peach blossom if activated correctly with the right enhancers. Having a door in this area can bring in new opportunities and lots of travel and perfect for a company that deals with travel or printing although it would be very wise to install a soft close hinge on the door. Do not use fire or metal in this area or colours white, silver this month. Do not worry if you have these colours for the annual star, just introduce colours blue or black in the way of a floor mat, cushions, tablecloth or such like. Avoid fire element and colours red, pink or purple. Good colours are blue, grey or black. This is a lovely influence for the month if also activated with the annual cures and if you follow all this advice here your month will be just fine. Although we have the inauspicious #3 in the northwest this month, we also have the annual #9 fly in which will drain energy from the #3 star. If you have your annual cures in place, there is little to do apart from introduce some fire colours and keep the area calm and quiet as we have Tai Sui located here for the year. To remedy its effects, use red decorative objects, candles, lamps and lights. A nice simple cure is a red, pink, purple, burgundy (fire colour) floor mat or a table lamp with a red shade which will also work to strengthen the annual #9 star. Do not use metal (metal colour is ok) to control this energy. Please remember that we have Tai Sui located in the west for 2019 and noise and activity can activate it’s malevolent effects so please make sure you have a Xie Tai Tai Sui plaque here. Do not undertake any form of noisy renovations or re-decorative work in this part of your house or office this year if possible and especially not in February. Nor should you disturb the ground by digging, building foundations or conduct any maintenance work with any noisy equipment in this area inside or outside your property or garden this month. To view our range of cures and enhancer for the monthly visiting #3 star, click here. These cures can be moved around the home or office to enhancers the monthly #3 star. On the 4th of February, we have the monthly #2 inauspicious earth star fly into the centre along with the annual #8 auspicious earth star. My advice would be to activate the #8 star with the annual cures but also introduce a lot of metal cures and colours to supress the monthly star. This may seem counterproductive but it’s the best way to treat this combination. What should I do if I have a bathroom in the north? What colors are best this year! The best colours for 2019 are watercolours such as blue, black or grey.